​Finding the perfect front door is an important and highly creative decision for your home. In addition to the door itself, the added features you choose can express your unique taste and creative flair and improve your home's energy efficiency and safety. While every home may not need front doors with glass inserts or sidelights and transoms, there are plenty of other options to choose from. Many options can offer elegance and beauty without sacrificing your front door's security and efficiency. Read on to learn more about front doors with glass and other added features. 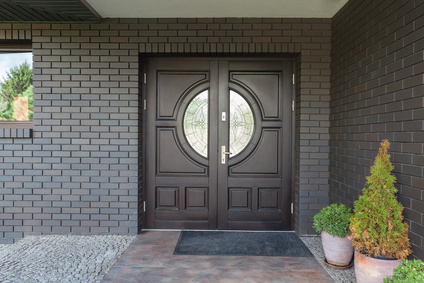 There are multiple factors to consider when thinking about additions to your front door, including durability and energy efficiency, as well as aesthetic appeal. It's standard to use tempered glass in front doors with glass, as it is much stronger and safer than regular glass. Rather than shattering into dangerous shards, tempered glass crumbles into relatively harmless pieces. Alternatively, some homeowners choose impact-resistant glass for their front door's glass panels. When broken, impact-resistant glass's pieces will stick to a thick inner layer of plastic that sits between its two outer panels. Decorative glass inserts are becoming far more common among front doors with glass today, because their unique flair enhances a home’s curb appeal, boosting its value. Generally speaking, front doors with glass inserts have three distinct layers: one decorative panel and two pieces of tempered safety glass to surround it. There are a variety of decorative glass varieties for homeowners to choose from, including baroque, beveled, camed, stained, or basic textured glass. Besides decorative front doors with glass, transom windows and sidelights can add elegance to your door as well as extra light to your entryway. A transom window is a horizontal window above a door or above another set of windows, while sidelights are narrow, usually non-operable windows that flank doorways. They can be installed individually or in a combined unit to match decorative inserts for front doors with glass, however sidelights are also available as single units for unique cases like nearby stairways where there is limited space or where homeowners seek to add entry light. Wood-cladding finishes can be added to fiberglass and steel to give the appearance of traditional wood. Wood front doors can also be stained in several different shades in order to take on a darker or light appearance. Additionally, there are many paint colors and protective clear polyurethane coatings that can be applied to any material. Front doors with glass that is Energy Star qualified can prevent drafts and other air leakage. There are several energy performance ratings to look for, such as air leakage (AL), solar heat gain coefficient (SHGC), U-factor, and visible-transmittance (VT). In general, just looking for double-paned tempered glass with low-e coatings will ensure energy efficiency and can be a good place to start. Entryways that include sidelights and transom windows or front doors with glass can improve your home's curb appeal, boosting its value. Whether you wish to express your creative side and make your home stand out, or simply want to brighten your entryway, there is a wide spectrum of additional features for front doors.